No doubt, some of you have watched Survivor. This immensely popular TV real life game show is watched by millions of people around the world. or simply because I don’t like your face. The ultimate goal is not to get voted out. And the way to survive is to make sure that there are people on your side – alliances are made – and broken – leaving behind a trail of betrayal and suspicion. This is real life played out in a game show. That’s perhaps the reason why Survivor has been so popular – it brings out the best and worst in people – more often the worst than the best. The winner is not the person who is kind and considerate, but who makes friends, uses them and then turns against them. The winner is not the person who is the better or the nicer but the one who is ruthless and hurtful, who has no feelings for the others. One person who was asked about his view of the show nailed it on the head when he said, "It’s sorry that our society is this way, but the people who are conniving and back-stabbing are the ones who make it. Unlike the movies where the scriptwriter controls the plot and good triumphs over evil. In Survivor, no one controls the plot and how things eventually turn out. It is a sad commentary on the way the world is." Blessed are those who earn six figures. Blessed are those who don’t have anything to worry about. Blessed are those who have the determination and ruthlessness to eliminate everything that hinders the fulfilment of their dreams. Our view of happiness depends so much on our circumstances and environment. For a young woman true happiness might be to find the right man, to marry and have a family, only later to find herself thinking that true happiness would come if she could divorce her abusive husband. For teenagers, true happiness is getting their first car, but its not too long before they realises that they would be truly happy if they could have a certain car that was sleeker and faster. Happiness is a common desire. Yet, so few people seem to have true happiness that we put it in the same category as four-leaf clovers and the pot of gold at the end of the rainbow – the elusive, the unattainable, the impossible. Happiness is a goal that we all strive for, but when that goal is reached, we realise that there is always something else that would make us truly happy. I’m sure you can think of things that you would like to see changed in your life so that you can be truly happy. So we go about suitably arranging – and re-arranging – our environment and circumstances – so that we will be happy. On this basis, people have assumed that, if they are unhappy, it is because of this wretched washing machine, this wretched heart, this wretched person I am living with… They believe that they will become happy by changing their lot in some way. It becomes a never-ending quest. Happiness, we assume, must be fun and laughter and expressing our own personalities ("doing our own thing") – free from suffering, sorrow and hardship. It’s no wonder that we can’t ever say that we have reached our goal – true happiness. There is nothing wrong with the desire to be happy, there is everything wrong with the way we often go seeking it. they lack the spiritual resources to cope with the upsets in life and easily become depressed and miserable). they are sad because of what death has done). they don’t push themselves forward and are satisfied helping others. (These people can hardly be called "happy" because of their deep sense of what is right; they are passionate about justice for the underdog and won’t rest until something is done. They are unhappy about the treatment of refugees, unnecessary logging, the treatment of prisoners. Can you see that Jesus’ definition of what it means to be blessed doesn’t depend on us and what is happening around us? 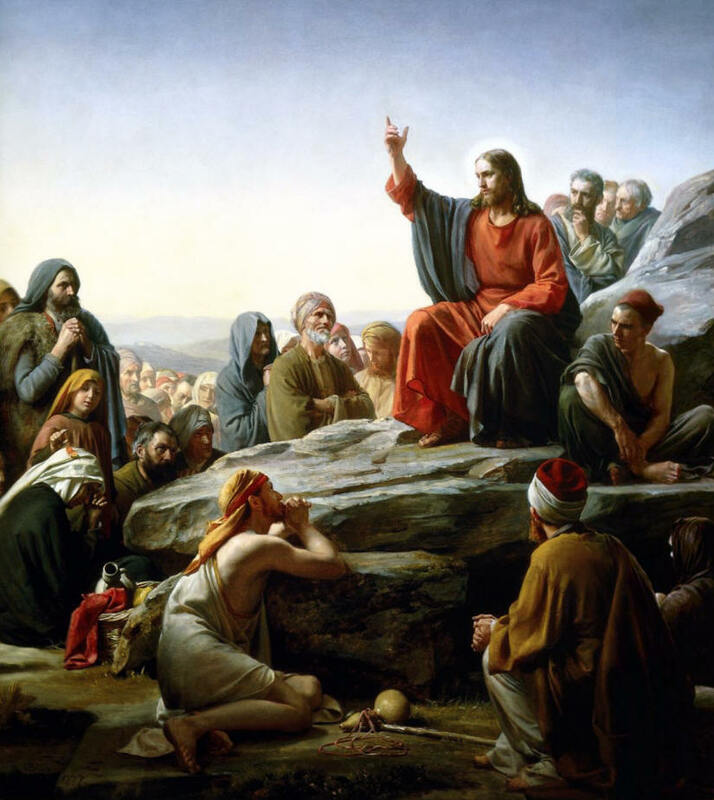 The "happy" sayings of Jesus – the Beatitudes – present us with a whole new idea of what it means to be happy. True happiness has to do with knowing God, belonging to God's Kingdom, being a part of God's family. You might say that this is hardly a popular view, especially when worldly happiness depends so much on money, a house, the right car, and being free from sickness, death and anything that upsets our "happiness". But Jesus was one for making true statements. True happiness is to be found in God. The fact is that we don't find happiness by seeking happiness. We find God, and discover a deep level of happiness. Or perhaps it is better said that God finds us. God meets us, he strengthens us, he comforts, he helps us endure, he gives us the courage to move on. A woman was the victim of abuse as a child. She understood what had happened - she didn’t like it – she had been angry but God had helped her through her anger and now she prayed for her father. She also helped her brother to come to terms with what had happened and to rebuild his relationship with his father. She had suffered a great deal and yet she would say that she was blessed. The inner and outer scars will always be there, but she was happy because God was with her. He had helped her though it all and now God was using her to be a peacemaker. George Matheson was a great preacher and hymn writer who lost his sight at an early age. He thought of his blindness as his thorn in the flesh, as his personal cross. For several years, he prayed that his sight would be restored. Like most of us, I suppose, he believed that personal happiness would come to him only after the handicap was gone. But then, one day God sent him a new insight: The creative use of his handicap could actually become his personal means of achieving happiness! So, Matheson went on to write: "My God, I have never thanked you for my thorn. I have thanked you for my roses, but not once for my thorn. I have been looking forward to a world where I shall get compensation for my cross, but I have never thought of the cross itself as a present glory. Teach me the glory of my cross. Teach me the value of my thorn." George Matheson had found God’s kind of happiness - the kind of happiness that is not only a future hope, but also a reality in the here and now. That’s the kind of happiness that enabled the apostle Paul to write to the Philippians from his gaol cell, "Rejoice in the Lord always. I will say it again: Rejoice!" (4:4). That’s the secret of true happiness! whatever the case, you can still "happy" in the knowledge that you are one of God’s precious children, that he sent his Son to die for you, and that when all is said and done, there is a place for you in heaven where there will be no more unhappiness. This is the kind of "blessedness" or "happiness" that no circumstance or person can take away from us.